Our gourmet group met recently. We decided that we should take a relaxed approach to the evening...nothing fancy, just good food, good wine and good company! It was my turn to take the appetizer and after much deliberation I decided that Sweet Mustard Shrimp would be a perfect start for our meal. I have posted this recipe before but it is always nice to revisit those dishes that are reliable! Combine the first five ingredients in a bowl. Whisk in the oil. Stir in the dill and onion. Chill, tightly covered. 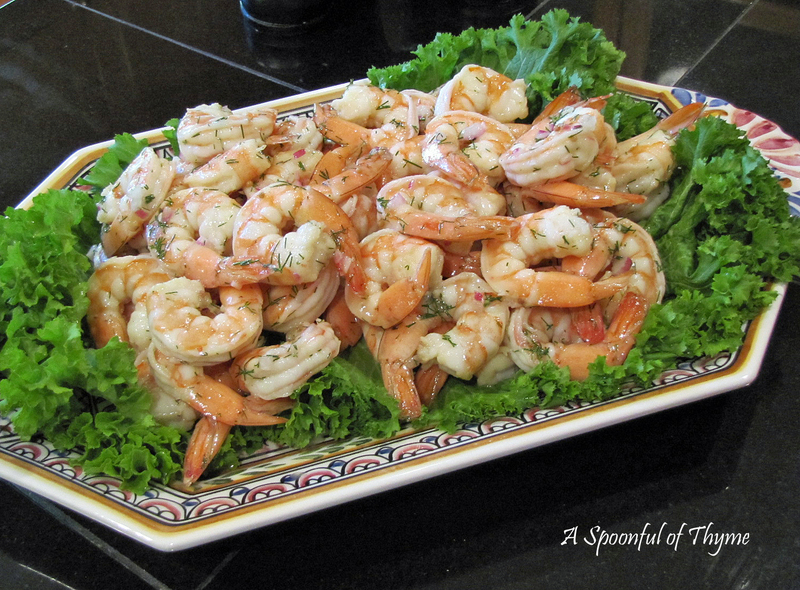 If you are using fresh shrimp, peel and devein the shrimp. Steam or boil until done. If you are using frozen cooked shrimp, defrost in a colander under cool water, then steam or boil until done. Place the marinade into a large Ziploc bag and add the shrimp. Seal tightly and chill in the refrigerator for at least 3 hours or overnight. Serve over a bed of greens. This is one of those no-fail recipes that is a delicious appetizer. They are succulent, bursting with flavor and perfect with a glass of wine! I am participating in Full Plate Thursday hosted by Miz Helen's Country Cottage, Foodie Friday hosted by Michael at Designs by Gollum, Flashback Friday hosted by Suzy at Kitchen Bouquet, and Fat Camp Friday hosted by Miranda at Mangoes and Chutney. This shrimp dish, I gotta make sometime..
Looks and sounds very good - nice change from regular ole boiled shrimp with cocktail sauce. Gorgeous presentation! I've got dill growing at the base of the Gazebo so I can't wait to try this version. Thanks for sharing it. Simple. Perfect. I'd love to join your club! I've got great gobs of dill growing, too! Great summertime food, Kate. This, along with crusty bread and a glass of wine, is a perfect lunch or dinner. I bet your group loved this dish. Looks delicious, not to mention pretty in the presentation! Lovely platter! I am glad you reposted the recipe as I missed it the first time. And Clos du Bois to go along with it!! Definitely a gourmet evening. I'm all about good appetizers and wine. This looks fresh and flavorful. I'm loving that little Chef holding that bottle of wine! Too cute! I'd love the WHOLE platter! I'll have to give this a try one day this summer. Thanks for joining in for the Flashback this week! 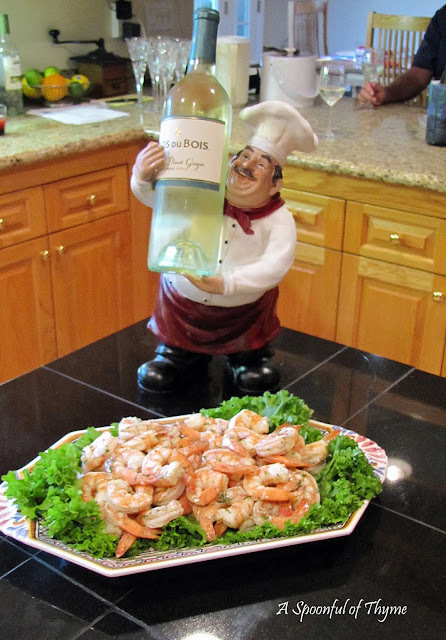 Thatshrimp looks so great, and I love your wine holder! Love your recipe. It reminds me of Shrimp Remoulade, but not the one with the mayo. Your presentation is beautiful. Bet there wasn't one shrimp left. Looks like a great party, wish I was there! 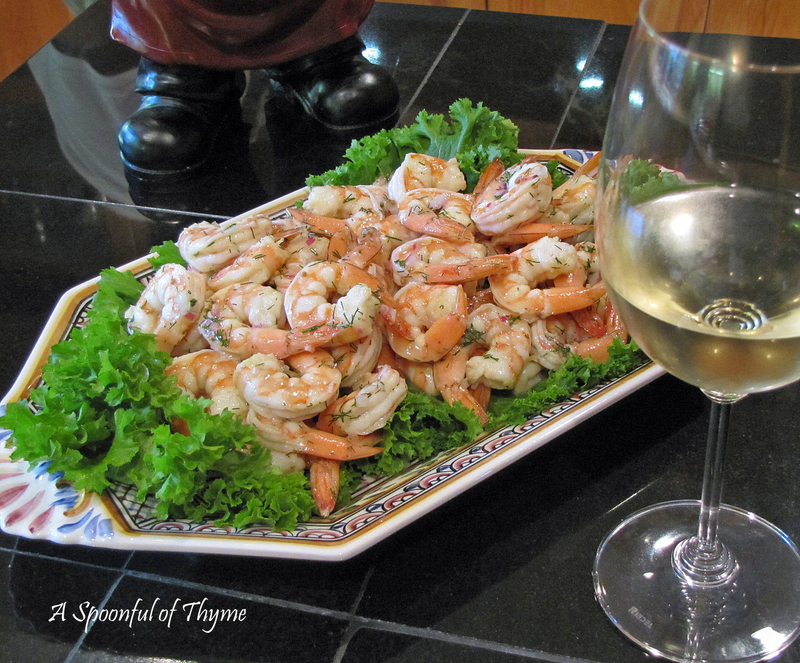 Your Sweet Mustard Shrimp is so full of flavor and a great presentation. We would really love this Shrimp. Thank you so much for sharing with Full Plate Thursday and sure hope to see you again real soon! Beautiful, Kate. Everyone loves shrimp! 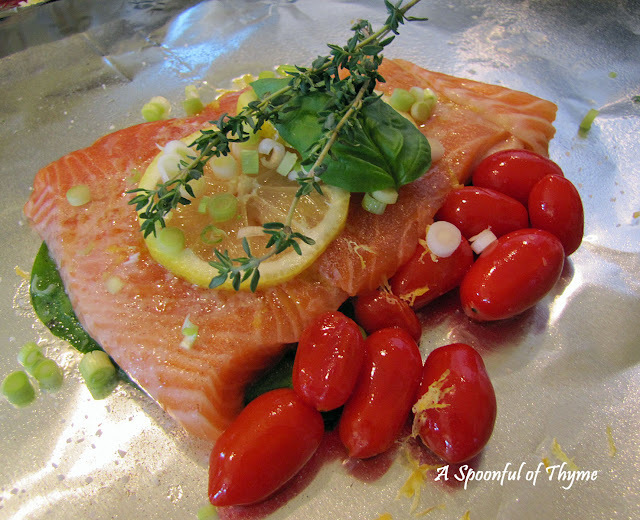 This is a great recipe, nice and tangy! That sounds like it would be great! Nice and easy except for cleaning the shrimp! Both You & that little chef will make me very happy.....Just keep on filling my plate & glass!Yum! Your dish looks mouth-watering! Thank you for sharing your recipe! Thank you for sharing this special recipe. I can see where this will be a keeper!! This is perfect for a summer afternoon, and the wine is the perfect accompaniment. Butterfinger Pie the Easy Way!